Graduate of the Institute of International and Development Studies (GenevaSwitzerland), as well as of the Ecole Nationale d’Administration (ENA-France), with a Masters of Arts in management of the non-profit sector (Rome-Italy), Mr. Kamarotos has a wide experience in international organisations, including 15 years in humanitarian affairs, human rights and the rights of the child, both at the UN and in NGOs. He has also been director of major EU programmes for the Mediterranean basin, as well as former Deputy Director General in charge of International and European Affairs of the French Region Provence-Alpes-Côte d’Azur. 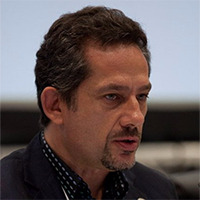 From 2009 to 2016, Deputy Director General of Public Services International (PSI) a global federation of Trade Unions working for the promotion of quality public services and trade union rights with affiliates in 150 countries, Alex is the Executive Director of Defence for Children International (DCI)’s International Secretariat in Geneva since November 2016.